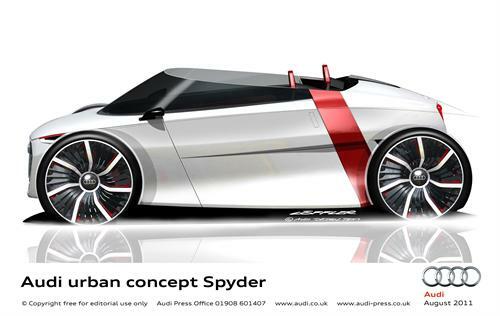 An open-air Spyder version of the outlandish Audi urban concept is ready to make light work of the Frankfurt Motor Show next month (September 17-25) alongside the recently announced Sportback model. These radical and weight-optimized 1+1-seat technical studies are not descended from any previous Audi model – their development is based on the strict principles of lightweight construction, efficiency and reduction. The highly-concentrated look of the concepts, with their forward-urging lines, free- standing 21-inch wheels and protective surrounding plates incorporating strips of ‘blinking’ LED lights is dynamic and innovative, and lends a completely new impetus to the Audi design language. Characteristic features of the Spyder include its low, continuous window area and its doors that open upwards diagonally. Inside there is sporty, low-slung seating for two mounted in a slightly staggered position and underpinned by carbon fibre-reinforced polymer (CFRP) which integrates each seat undercarriage. All controls and materials are subject to the dictates of ultra-lightweight construction to ensure they convey a unique, sensory allure. The driver can adjust the steering wheel and pedals for his or her own driving position. Two e-tron electric motors provide the propulsion – giving the ultra-light Audi urban concepts the ability to accelerate powerfully. A lithium-ion battery supplies the energy – ideal for extended city tours.